Today we are doing another giveaway with Tripp Boutique! Their online boutique is super cute and full of reasonably priced items. Here are a few of our favorite necklaces! Check out their store and let us know your favorite piece by commenting below! That's it! Don't forget to like their Facebook page and good luck! Giveaway ends Sunday December 2, 2012 at midnight! The winner of the Trendsnag.com giveaway is Celeste! Congratulations and we will be contacting you! My favorite is the Leaf Necklace. It's so beautiful and organic looking. I absolutely love the leaf ring, skull bracelet, and floral back pack. I think I'll be making purchases from their site even if I don't win the give away. The Arrow Ring in both gold and silver would be my "go to" piece! I love the aqua and royal blue studs. They are so beautiful. The beaded knot necklace is also gorgeous. I had never seen this site before, I’m glad you posted it. They jewelry is super cute and affordable. The leaf necklace is gorgeous! I've never heard of this site before, but I certainly love it now! A lot of their stuff reminds me of baublebar...but I think tripp is less expensive. I think the bubble necklace and the beaded rainbow necklaces are super cute! Oh the floral backpacks are great!! I love the diamond studded wrap bracelet in brown! so prettyyy :D i like the gold shoulder chain- what an original idea. I love the leaf ring! So cute! I like the leaf ring! I'm loving vintage drop earrings -- they are so pretty and well-priced! What a great shop! Love the girl next door necklace and the arrow ring/bracelet. Nice to finally find a trendy and affordable site! Keep up the good work. I love the aqua and royal blue studs! The Fancy in Pink necklace is too pretty! love the bubble necklace! thanks! Love the aztec bracelet! Neat store! The leaf ring is perfect!! I love the scallop necklace!!! Love the red bead necklace...perfect for the holidays! I LOVE the scallop necklace! It is so adorable! Can't choose between the half moon necklace and the starburst earrings! floral backpack is my favourite! I like the "girl next door" necklace. Turquoisey colors are my favorite! I love love love the minty green scallop necklace. BLACK RAIN NECKLACE!!!!! Also loving the leather tubular bracelet! So hard to choose!!! They have so many amazing pieces!My favorite is the ARROW STACKED RING! I love the blue floral backpack! SO CUTE! I love the Beaded Rainbow necklace. Half moon necklace is gorgeous <3. Such a great shop to add to my bookmarks. I love their necklace collection. The half moon necklace & the minted drop necklace are my favorites! I'm obsessed with the Tiny Droplets necklace! I have been loving leaf style jewelry lately, so i love the leaf necklace! love the Tiny Droplets necklace! My favorite piece is the Orange Drop Earrings :) Soo pretty!!! That arrow bracelet and scallop necklace are so pretty. love love LOVE the leaf necklace! thanks for introducing me to this site, awesome stuff and great prices!! my favorite are the slouchy boots!!! SO CUTE! 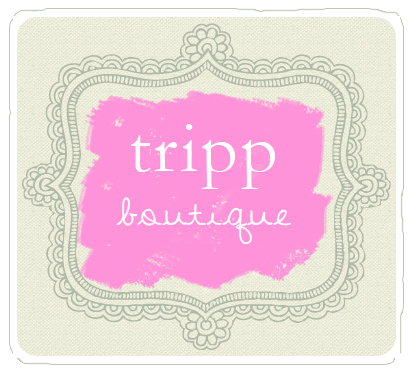 I'm officially in love with Tripp Boutique ♥ thanks for this awesome giveaway! I really love the Half Moon Necklace! I loveeee the aztek bracelet!